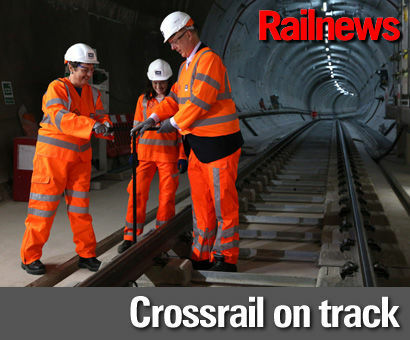 THE last section of track for London Crossrail has been laid, and the event has been hailed as a ‘major milestone’. The phased opening programme should mean that Elizabeth Line trains are reaching Reading – the last link – by the end of 2019. A construction train has already run under London on the new track between Plumstead and Royal Oak, passing through nine new stations en route, and Railnews understands that a test train is set to enter the existing tunnels leading to Heathrow next month. Trains are already running on the future Elizabeth Line between Liverpool Street and Shenfield, and the next opening will be Paddington to Heathrow in May. The major event will be the opening of the central London tunnels. This is due in December 2018, when services start running between Paddington and Abbey Wood. Trains from Paddington will reach Shenfield in May 2019, replacing the present interim service from the main line platforms at Liverpool Street, and Paddington to Reading will follow in December 2019. Transport secretary Chris Grayling and deputy mayor for transport Val Shawcross joined Crossrail chairman Sir Terry Morgan and chief executive Andrew Wolstenholme in the eastbound tunnel of the new Whitechapel Elizabeth line station – where the final rail clips were fixed by track quality control engineer Ellen McGuinness. A workforce of more than 1,000 has installed 63,000 sleepers, 51,419 metres of rail and over 800 sections of Long Welded Rail which make up the new 50km + of Elizabeth line track. Over 13,500 m3 of concrete – enough to fill several Olympic sized swimming pools – was poured by the concreting train as part of the track installation. These contracts have included the new fleet of Class 345 trains which are being built by Bombardier in Derby. The first to be delivered have already entered service on the line between Liverpool Street and Shenfield using the temporary brand of TfL Rail. London Mayor Sadiq Khan said: “The completion of the track is a huge milestone on the way to finishing a project that will transform transport across London and the South East. With brand new trains and step-free stations, the Elizabeth line will provide a truly world-class service for passengers, and this important landmark is testament to the hard work and expertise of all the men and women who have been working on the project.